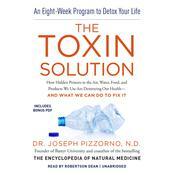 Eliminate avoidable toxins, mitigate the effects of those you can’t avoid, and enjoy a longer life with this essential health guide from a pioneer in integrative medicine, Dr. Joe Pizzorno—the author, teacher, practitioner, and founder of Bastyr University, the country’s first and largest fully accredited university of natural medicine. 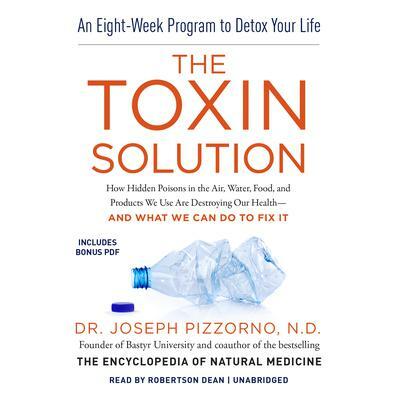 Dr. Joe Pizzorno is convinced that lifelong good health rests on two key determinants: your exposure to toxins and your ability to process them in your body. While lifestyle, diet, and genetics all play a major role in well-being, many symptoms of declining health and chronic disease are rooted in toxic overload—our exposure to a barrage of chemicals, heavy metals, radiation, electromagnetic frequencies, and pollution that are the byproducts of modern life. While the human body has an innate capacity to detoxify, it cannot cope with the elevated levels of toxins we are exposed to today. Most alarmingly, this toxic overload has helped transform once rare diseases into epidemics affecting people of all ages. repair some of the damage toxins have caused. Fortunately, our bodies have a tremendous capacity for healing and recovery. With The Toxin Solution, you will discover how releasing and avoiding toxins can help you to feel better today—and every day for the rest of your life. Dr. Joe Pizzorno founded Bastyr University, the country’s first and largest fully accredited university of natural medicine, and served as its president for twenty-two years. He is the author of The Encyclopedia of Natural Medicine and The Textbook of Natural Medicine. He is a founder and board member of the Institute for Functional Medicine and founder and editor-in-chief of Integrative Medicine: A Clinician’s Journal, the leading peer-reviewed journal in integrative medicine. He has been honored by the American Association of Naturopathic Physicians, the National Foundation for Alternative Medicine, and Natural Health Magazine, and he has served on presidential committees under Presidents Bill Clinton and George W. Bush.